bella terra: blackberry jam, anyone? I can’t believe I’ve waited so long to talk about jam this summer! Here it is, mid-August, the blackberries are nearing the end of another extremely productive season and I am just now sharing these recipes with you. It seems that our bush quadrupled in size from last year, and the bounty we’ve received reflects that growth. I am giddy thinking of next year’s harvest, since the new growth taking over our fence and gate will bear what surely must be another quadrupling of this year’s numbers. Oh, the possibilities. I must admit, I’m somewhat happy to see this blackberry season come to an end. In just a couple of weeks I’ll be able to cut back all of this year’s fruited wood, and will have the space needed to train the new growth and reclaim our entrance to the garden. Blackberries bear fruit on the previous year’s growth, so as the new arms have reached out into any space they could creep to, we’ve been powerless to do anything about them. I can’t bear the thought of cutting any of them back, for fear of what that would do to next year’s harvest, but I will be very grateful to not have to play limbo to pass through the garden gate. I’ve actually shared this recipe with you before, in the springtime when Florida strawberries hit Virginia stores and I couldn’t help buying multiple quarts. Molly’s jam recipe is really the only one you need, as it can be modified to use any variety of fruit available at any time of the year. And modify we have, for Brian and I have been jam-making machines this last month. We wanted to preserve as much of the summertime bounty as we could, and since our blackberry bush has produced approximately two dozen quarts of deep purple berries in just 30-days time, jam seemed like an obvious solution. We’ve also frozen half a dozen quarts for use through the fall and winter (its doubtful they’ll make it to spring), made a couple of pastries and plenty of smoothies. But our favorite use of our overabundance of the sweet-tart fruit has been jam. So far we’ve tried three different varieties with our blackberries, and we have a few more in mind to try out this weekend. The peaches we’ve been picking have come in handy too, providing a natural sweetness that allows us to cut the sugar used in the original recipe. We’ve been eating jam on biscuits, waffles, pancakes, almond butter sandwiches and even pork tenderloin as a delicious glaze. We have jars upon jars stored up in our pantry, waiting to be given to friends or consumed by us over the next 11 months. 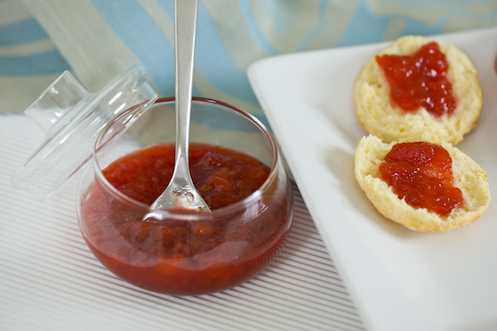 In fact, one lucky reader will receive a 6oz jar of Bella Eats Jam to enjoy! Just leave a comment on this post telling me your favorite jam/preserves/jelly flavor. Who knows, maybe you’ll see your flavor featured after our next experimentation! I’ll announce the winner on my next post, so comment away until then. To peel peaches and plums, bring a large pot of water to boil. Slice a large "X" into the bottom of each piece of fruit. Drop the fruit, 3-4 at a time into the boiling water. Let boil for 45 seconds and remove with a slotted spoon to a large bowl filled with ice water. When fruit is cool (about 1 minute) remove to a cutting board and peel skin, which should pull apart from the fruit easily. Chop fruit into 1/2-inch dice. 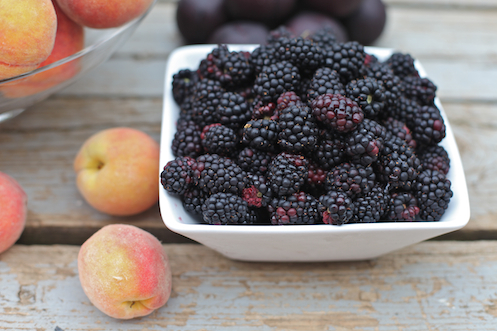 Toss blackberries with peaches or plums in medium-size bowl. Add sugar and lemon juice and toss to coat. Let sit for 2 hours, stirring occasionally. Prepare canning jars as per canning instructions (see recipe above or instructions for your canning equipment). Transfer fruit mixture to a 4-quart saucepan and bring to a boil over medium-high heat, stirring occasionally. Crush the fruit with a potato masher and let continue to bubble until it thickens, about 20 minutes. 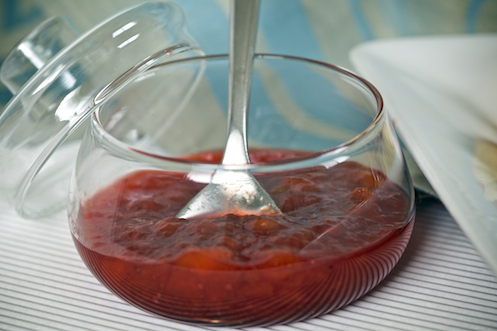 Dip a metal spoon into the jam and then hold it over the pot, letting it drip for a few moments to cool. Run your finger down the back of the spoon, through the mixture. 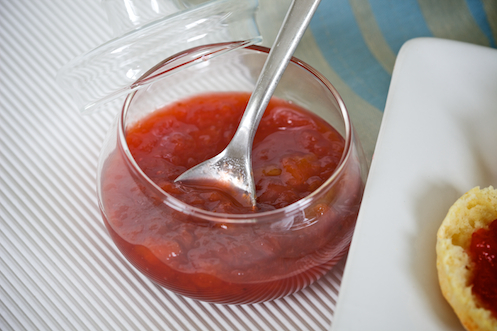 If your finger leaves a clear path on the back of the spoon, the jam has cooked long enough. If not, keep cooking and test every 5 minutes until you get a clear path. Spoon jam into prepared jars and process according to canning instructions (see recipe above or instructions for your canning equipment). 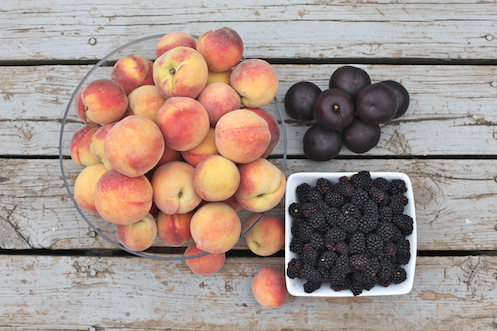 Use the same method as above, except separate the blackberries and peaches into two separate bowls. 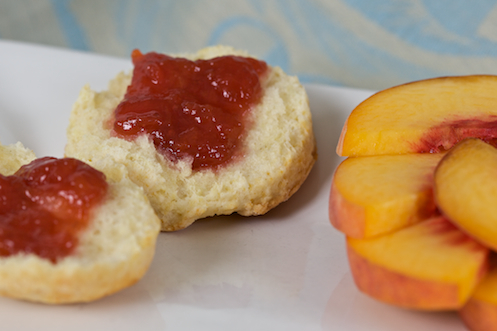 Toss the peaches with 1 tbsp lemon juice and 3/4 cup sugar. Toss the blackberries with 1 tbsp lemon juice and 1/2 cup sugar. After two hours, puree' blackberries in a food processor or blender, then strain to remove seeds and pulp. Stir blackberry puree' into peaches and continue with step #4. And, if you're not sure what to do with the 24-ish ounces of jam the recipes above produce, make this cake [pictured above], using the jam instead of the filling. Or, give jars out to your friends - they'll love it, I promise.